Resolve to manage taxes, invest for the future, and plan for the unexpected. Manage taxes to help keep more of your money. Now that you’re retired, or nearly there, you may find that you need to pay even more attention to your finances than you did when you were working. After all, your savings may need to get you through decades of retirement. To help keep a handle on things, consider setting some New Year’s resolutions. Fidelity’s 2018 New Year Financial Resolutions Study found that people who set resolutions at the beginning of 2017 and stuck with them through the year were more likely to say they are optimistic about their finances than people who didn’t make financial resolutions (56% compared with 42%). Here are 3 financial resolutions to consider for 2018. Thinking strategically about your withdrawals from savings could help you save money on taxes. If you are over age 70½, you’ll generally have to take annual required minimum distributions (RMDs) from tax-deferred retirement accounts like traditional 401(k)s and IRAs and pay taxes on those withdrawals. But when it comes to withdrawals beyond RMDs, it can help if you’re able to choose which account to draw from—and when. It generally makes sense to withdraw first from taxable accounts, like a brokerage or bank account, followed by tax-deferred accounts, such as a traditional IRA or 401(k). Tax-exempt accounts —Roth IRAs and Roth 401(k)s—should come last, which allows your savings to grow tax deferred as long as possible. Another withdrawal strategy may help you manage your tax bill. For example, depending on your tax situation, you may want to limit your withdrawals from taxable and tax-deferred accounts to an amount that brings your taxable income to the top of your current tax bracket, and then cover any remaining income needs from your tax-exempt accounts, such as Roth accounts, to avoid being bumped into a higher tax bracket. This strategy can be complex, however, so be sure to consult your tax advisor. Retirement can last a long time, and investing too conservatively can be as risky as being too aggressive. An overly cautious approach can result in the spending power of your money being too exposed to erosion inflation. This approach can also limit the long-term upside potential that diversified stock investments can offer, and possibly diminish how long your money may last. On the other hand, being too aggressive can bring excessive risk of losing money in down markets. 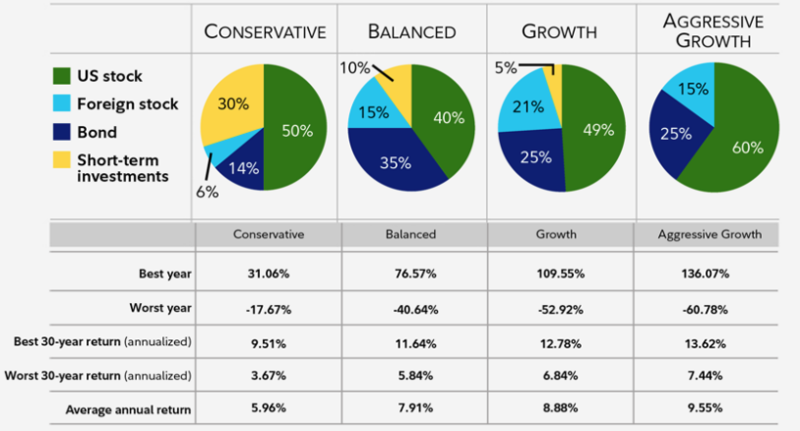 Consider an asset mix with the level of risk and return you are comfortable with. Data Source: Ibbotson Associates, 2017 (1926–2016). Past performance is no guarantee of future results. Returns include the reinvestment of dividends and other earnings. This chart is for illustrative purposes only and does not represent actual or implied performance of any investment option. Stocks are represented by the Dow Jones Total Market Index from March 1987 to latest calendar year. From 1926 to February 1987, stocks are represented by the Standard & Poor’s 500 Index (S&P 500® Index). The S&P 500® Index is a market capitalization– weighted index of 500 common stocks chosen for market size, liquidity, and industry group representation to represent U.S. equity performance. Bonds are represented by the Barclays U.S. Aggregate Bond Index from January 1976 to the latest calendar year. The Barclays U.S. Aggregate Bond Index is a market value–weighted index of investment-grade fixed-rate debt issues, including government, corporate, asset-backed, and mortgage-backed securities, with maturities of one year or more. From 1926 to December 1975, bonds are represented by the U.S. Intermediate Government Bond Index, which is an unmanaged index that includes the reinvestment of interest income. Short-term instruments are represented by U.S. Treasury bills, which are backed by the full faith and credit of the U.S. government. Strike a balance this year. Consider resolving to review your investment mix, and make sure it offers growth potential to meet your goals through a retirement that may last multiple decades. Be sure to think about your risk tolerance and make sure you’re comfortable with the increased risk that may come with stocks—it’s a balancing act. It’s important to plan for contingencies so that you can live and age well in retirement. This means planning your withdrawals so that your savings will last throughout retirement, being prepared for health care costs, and estate planning. Determining a sustainable withdrawal rate early in retirement is important in helping your savings last throughout your life. In general, consider withdrawing no more than 4% to 5% of your savings in the first year of retirement, and then adjusting the amount every year for inflation. Deciding the best rate of withdrawal for your situation can be complicated. Try this calculator to get an estimate: A spending plan with staying power. Then consider speaking with a financial professional. Read Viewpoints on Fidelity.com: How can I make my savings last? Resolve to make this the year you put plans in place for your savings, your health and wellness, and your end-of-life plans and wishes. Estate planning isn’t just for the old or rich. A basic plan includes a will and instructions for what happens if you become incapacitated. Naming a health care proxy, establishing a “living will” regarding end-of-life medical care, and naming a power of attorney can help your loved ones understand your wishes. Adding or updating beneficiaries on your IRAs or other retirement accounts is important because these accounts transfer directly to the named beneficiaries outside of the estate and probate process. People who kept their resolutions throughout the year used some similar tricks to make their resolutions a habit, the survey found. Making some progress on their goals encouraged them to stick with them, and tracking progress made it easy to gauge how far they had come. Breaking down big goals into attainable milestones also helped resolutioners stick with their plans. Deciding to take control of your finances and taking small, consistent steps toward your goals could help you feel better—and more importantly, set you up for a successful 2018 and beyond.